REGROUPING. The Boling "family" unit strategizes their next move during a poverty simulation learning experience put on by the Schools of Education & Human Development and Nursing & Health Sciences. Arris Owens didn't know why she ran away. "It was just instinct, I guess," she said. "A fight or flight response if you will. I was thinking about being evicted from our house, and I just wanted to check and make sure I was still allowed to go there." Owens, a senior nursing major, didn't run away in real life. Rather, it was a role she was playing for an interdisciplinary poverty simulation coordinated by the Schools of Nursing & Health Sciences and Education & Human Development for nearly 100 students last month. 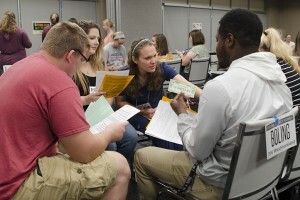 "The event was really eye-opening," said Ashley Burgess, an MSN student. "You're taking yourself down to zero in terms of resources and budget. I've never had to think about where I will sleep at night, but that is reality for some people who actually live in poverty." "All of our graduates will someday interact with patients, clients, or students who live at or below the poverty line," said Professor of Nursing Lora Wyss. "This simulation helps our students understand just what decisions some of these folks are making and how they feel. When someone is poor we often think, 'why don't they just go get a job?' This exercise helps them consider a more complete picture." Director for the Center for Professional Development Nancy Varian used grant dollars several years ago to purchase the poverty simulation kit from the Missouri Community Action Network. The Community Action Poverty Simulation (CAPS)is a live action poverty simulation that asks participants to team up in "families," and, using the resources given, are charged with tasks such as keeping their homes secure, their utilities on, their payments made, their children in school, and responding appropriately to unexpected factors in their lives. The event held at Malone included volunteers of faculty, staff, community agencies, and even a Marlboro police officer. The simulation ended with a debriefing conversation about what it is like to live in poverty. "It requires a lot of strategy and teamwork," said Rachel Goddard, who had the profile of a 13-year-old twin under the care of her 21-year-old brother and no parents in the picture. "It was really hard to accomplish all of our tasks, and stressful to worry about survival. We definitely had to work together." "People really do learn to rely on each other," said Varian. "The simulation draws that out - they have to rely on each other to survive. I'm always struck by the response of the students at the discussion time. They are much more empathetic to the reality of others."